This Week in Anime: Total Eclipse of the YEEART! One of my favorite parts of watching and writing about anime is occasionally finding myself at a loss for words. Every once in a while, a series comes along that’s unique and crazy enough to leave me unable to do anything but mutter, “What the heck did I just watch?” This season has provided exactly that kind of experience courtesy of Ninja Slayer From Animation. For This Week in Anime, I’ve decided it’s time to see what in the world is going on with this shuriken-throwing oddity. 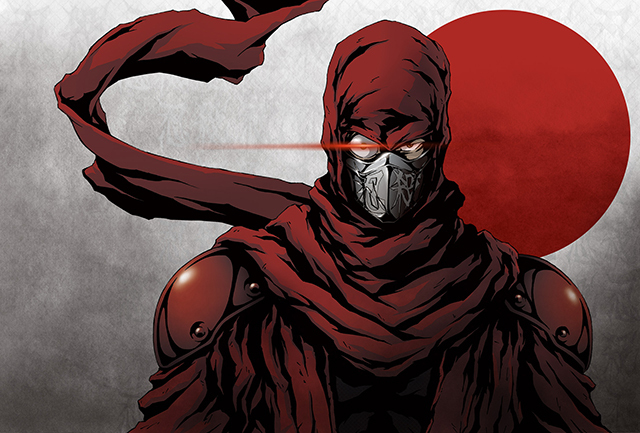 I’m still not convinced that I fully understand the mysterious origins of Ninja Slayer, but I’ll explain it as best I can: it’s an adaptation of a Japanese translation of an American story about a ninja who kills other ninjas. The main character was once an ordinary salaryman, but his life changes after evil ninjas murder his family. In order to get revenge, he makes a pact with the soul of a dead ninja to become the polite but deadly Ninja Slayer. In each episode, he kills his way up the hierarchy of a shadowy crime syndicate in search of vengeance and the truth. That summary makes the show sound dreadfully clichéd, and that’s kind of the point. Ninja Slayer exists partly to poke fun at its genre’s bad habits. It’s deadly serious, yet it’s also violent and stylized to a laughable extent. Nearly every character archetype under the sun is put onto the chopping block at one point or another, and the storylines all seem suspiciously familiar. Even as it mocks itself, Ninja Slayer also plays on foreign impressions of Japanese culture. Ninja Slayer seems to eat nothing but sushi, and he always greets his enemies by bowing and politely introducing himself. For bonus points, even his most despicable rivals extend the same courtesy. Watching this show is a bit like flipping through a middle school student’s doodles of cyborg ninjas hurling comically oversized throwing stars at one another. The animation in Ninja Slayer is also a bit of a joke. At several points in any given episode, the quality drops straight off a cliff. The art loses all illusion of three dimensions, and the characters don’t so much move as get dragged around the screen. Blood and explosions often look like canned effect templates that have been pasted into the general vicinity of where they ought to be. It’s as if the show exhausted its budget long before it was ever close to being completed, like some sort of legendary unfinished masterpiece. Between the writing and the animation, it’s difficult to tell just how seriously we’re supposed to take Ninja Slayer. Is it a deliberate parody, or does it intend to tell a story of its own at some point? Is it brilliant, or merely idiotic? Six episodes have aired as of this writing, and there don’t seem to be any obvious answers at this point. I suspect the answers will always be a bit murky, and everyone’s reaction to the show will be different. Some will find its deliberate flaws hilarious and endearing. Some will think it’s a clever piece of satire. Some will simply find it boring, or even hate it. Ninja Slayer is a very difficult show to recommend. People who love the shows it satirizes will be the most likely to “get” it, but they may also be the most likely to find it obnoxious. If you enjoy being confused and challenged by a work that might just be an insipid waste of time, then it’s definitely up your alley. As someone who enjoys puzzling over the oddities of the medium, I’m certainly hooked.